Actually it feels like the second Friday of the week since we had Thursday off for the 4th of July. Today I also have the last in the series of polishes that Hit Polish sent me that will be released on July 15th. Today's polish is called She's A Vegetarian and I can't believe how much I actually like this polish. 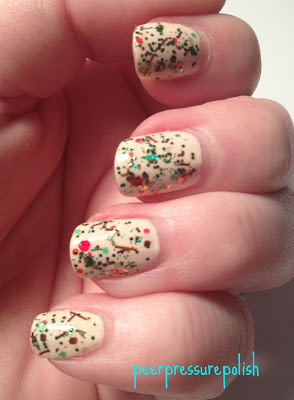 At first I wasn't sure how I was going to feel about it since it is a mainly green glitter topper. I thought it was going to feel too holiday-ish, but I am actually quite smitten with it. She's A Vegetarian is chock full of glitter, there are bars shards and hex glitter in there. I only used ONE COAT in the photos below. That's right, the glitter payoff you see below were obtained with just one swipe. Just like every other polish that she send and that I have purchased from Hit Polish, it applied easy and I have no complaints. I used a base of Rejuvacoat and Orly Bonder, two coats of Maybelline Canary Cool and then the one coat of She's A Vegetarian and topped with HK Girl. This picture is taken after I have worn it for a couple days!!! I already have a list of what I want to buy next based on the pictures of other polishes I have seen for her upcoming release. What do you want to buy? It reminds me of eggnog!